When you live in a 1950’s ranch, with 8′ ceilings, you’re always looking for ways to cook without firing up the oven and heating up the kitchen. We’ve had this really nice gas grill for a couple of years and all we ever do is cook steaks, burgers and chicken on it, so lately we’ve been reading up on things we could make on the grill. Tonight we decided to try a grilled pizza! Not knowing what to expect, we thought this would be a pain in the ^&*!! but it was actually quite easy and very tasty. It reminded me of an artisan pizza from a pricey restaurant, perhaps because of the toppings we used, but the crust turned out thin and slightly crisp, like a pizza cooked in a wood-fired oven. I can gladly offer a crust recipe to you, but all I did was pick up a powdered pizza crust mix from Walmart (it was even their brand) and followed the directions, which were basically “add water and stir”. Once you’ve got the dough together you will need to shape it. Start by flouring or lightly dusting with corn meal, a cutting board (better yet if you have a cookie sheet without sides, that’s ideal, because you can use it to transfer to and from the grill). Once you’ve shaped your dough (it doesn’t have to be totally round as mine wasn’t), put it on a lightly floured (or corn meal dusted) sheet pan for grilling. Make sure the grill is clean and spray it with cooking spray, then turn it on wide open. Once the grill is hot (when you can’t hold your hand over it for more than 2 seconds), slide the dough off the cookie sheet onto the grill and close the lid. Cook for 2 minutes. Once the pizza dough has browned lightly on one side, use your cookie sheet or pizza peel to remove it from the grill. Use a spatula to flip the dough over so that the grilled side is now up. Keep the grill covered so it retains its heat for the next step. Transfer your pizza back onto the cookie sheet or cutting board. Now add your toppings. We used pesto sauce from a jar, some diced chicken, sun-dried tomatoes and some fresh, un-stretched Mozzarella cheese (purchased in a ball), but you can use tomato sauce, standard toppings, grilled vegetables, whatever you would like. Just be careful not to use too much sauce (no more than 1 ladle full) or your dough will get soggy. Slide the topped pizza back onto the grill. If you are using a gas grill, reduce the heat. If working with a charcoal grill, close the vents on the cover almost all the way. Close the lid and cook for 2-3 minutes more, or until the bottom begins to char and the cheese is bubbly. Pull off the grate with a spatula onto a cutting board or other flat surface and let rest for a couple minutes before cutting into slices. This was our finished pizza! 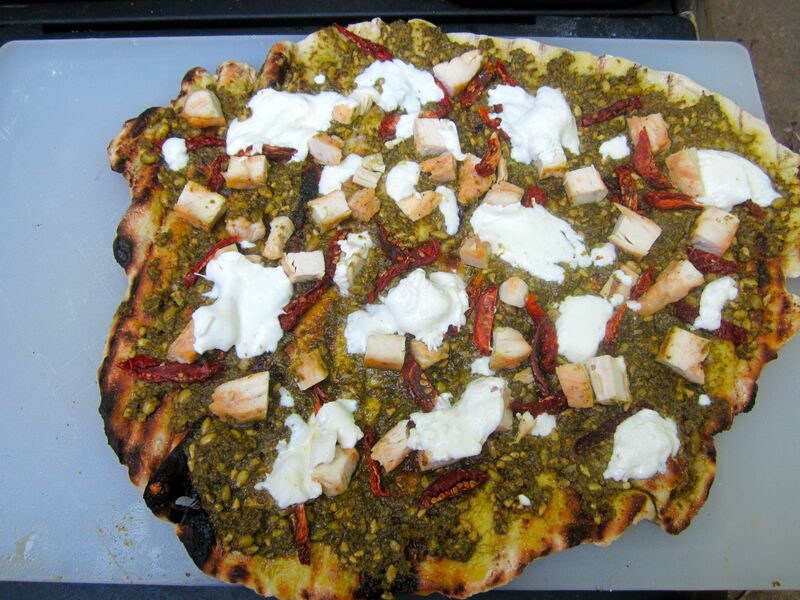 This entry was posted in Entree, Tailgating Recipes and tagged chicken, grill, mozzarella, pesto, pizza, pizza sauce, sundried tomato by quarlj01. Bookmark the permalink.